A trade union representing Catalonian crop growers and cattle ranchers has staged a protest, demanding that the EU compensate them for the revenues lost as a result of the escalation of sanctions, which have closed the Russian market to them. 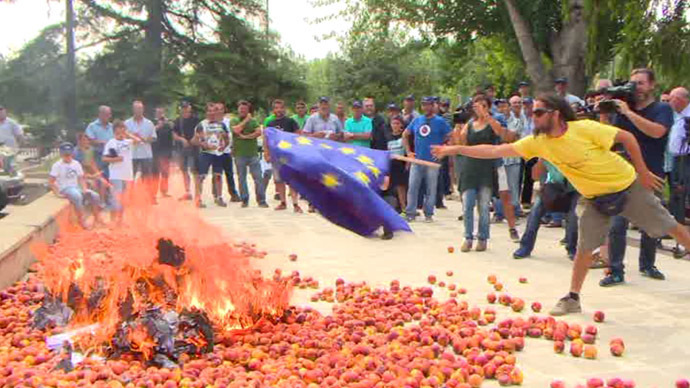 A group of about 30 representatives from JARC (Young Farmers and Ranchers of Catalonia), one of the biggest agricultural unions in the region, demonstratively burned crates of ripe peaches outside the Lleida municipality building. As a throng of journalists looked on, the unionists hurled an EU flag onto the bonfire, which disintegrated in seconds. "We will not accept any more that the EU keep telling us what to do, these people that have never set foot in a fruit field. For once you will have to listen to the producers, not the consumers," David Borda, a union official, told Ruptly news agency. Earlier this month, the European Union imposed sectoral sanctions on Russian banks and high-tech industries in connection with Russia's alleged meddling in the Ukrianina crisis. 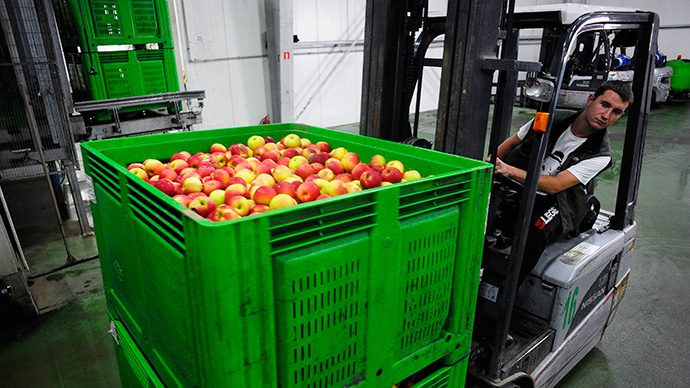 Russia, which said that it had no responsibility for events in eastern Ukraine, retaliated by banning imports of agricultural produce from the EU for one year. 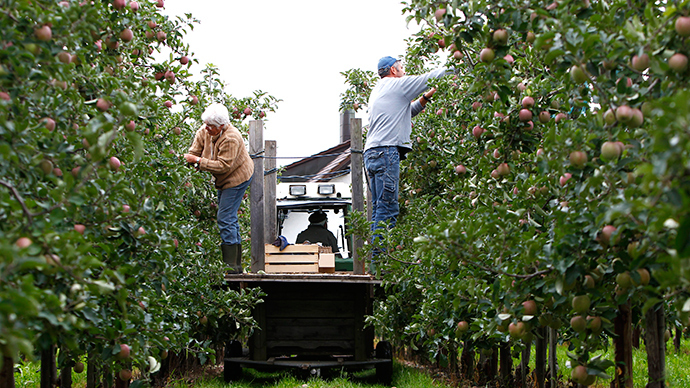 JARC, which also delivered a list of demands to government officials, believes that the European Union’s political standoff has harmed farmers, and says that they should be compensated through the raising of tariffs on imported fruit and vegetables from other countries, such as Turkey and Morocco. 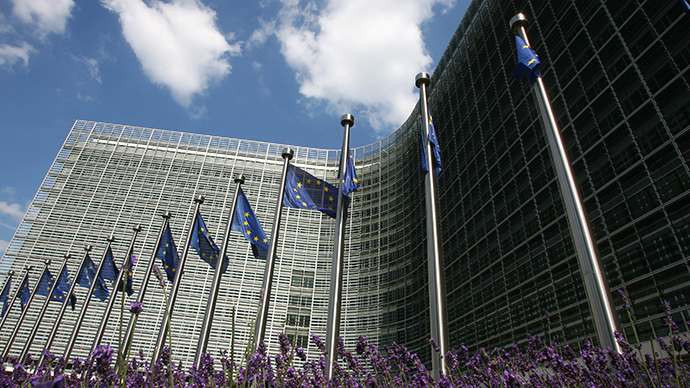 The EU has allocated €125 million to help farmers in the immediate aftermath. Finance group ING has estimated that the annual losses as a result of the blocking of the Russian market will amount to €6.7 billion a year, and could result in the loss of 130,000 jobs. 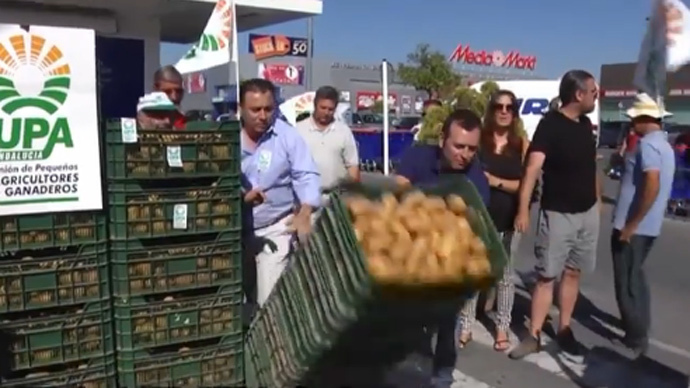 Similar farmers protests have taken place across Spain, though producers have targeted both, the EU and also Russia, whose consulate in Seville was picketed earlier this week.